Danny and Steve oversee the extraction of the Killer’s car from the bay while Chin and Kono process the scene with the poor painter’s body. Luckily for the plot, the killer left behind his hand and arm, still in a death grip on the wheel. This of course leads Steve directly to the answer. He must have seen this episode before! So CLAWMAN and Steve share a flashback of the day Jack McGarrett inadvertently exploded Clawman’s hands off in seriously what I hope is the grossest thing we ever see on this show. 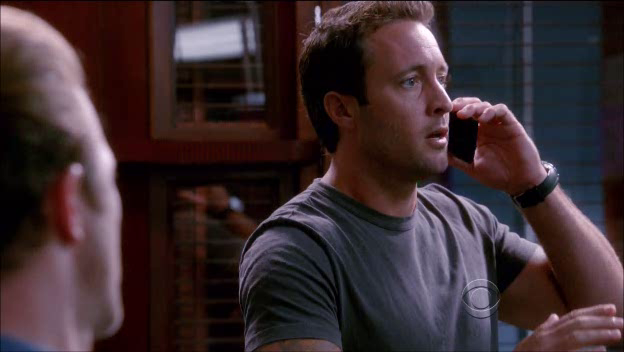 Kono then calls to say while Steve has been yet again indulging his nostalgia, Duke’s been shot. Steve just can’t catch a break in this episode, y’all! Steve and Danny go to visit Max who reveals that the plastic hand which killed the painter does indeed belong to Clawman. And now Max and Detective Williams are no longer on a first name basis and really — what is going on here? The Five-0s all hoof it down to Chinatown for a little illegal search and seizure (who knows, it may be legal in actual China). They figure out which room Clawman’s been living in and I guess Charlie ended up solving the case after all (he always does!) because his “Ode to an Upside Down O” obviously made traction with Steve as we get a clarica flashback to Charlie’s in-lab telestrator just in case we forgot! But Charlie! We could never! Forget you! Screencaps that make me laugh. A cross-street gun battle ensues and Steve pops the trunk of the Camaro with the key fob (for sure another thing that never happened in the original show) and tosses Kono a sniper rifle which of course is kept in there as you do. Steve then drives the Camaro down the block to Danny’s (by now expected) strong objections and Kono pops Clawman who falls down off the building into the street. The Five-0s congregate around the corpse with Steve yelling at Danny about being Scarface??? A reference you all will have to explain to me because I don’t get it and don’t even know how to start to research – and Danny’s saying Steve’s plan was flawed and it gets cute for a moment with the “you were worried about me / I’m touched” stuff and then sort of goes off the rails because now it seems like Danny’s really pissed about this and they’re not being cute anymore and huh. Seriously — what is going on here??? Steve has found one of the bullets with his name on it and is musing when one of the cops walks up and thanks him and HOLY CRAP! Steve is hallucinating! He is having a mental break! It’s……. OBI-WAN KEOKI! So I guess this makes Steve Luke Skywalker??? This is what happens when Danny gets upset: More ghosts! Across town, Cath puts her jewelry box back the way it was before, ’cause I’m thinking episode 3.16 is nothing but a fever dream Steve has as he’s adjusting to his psych meds. Maybe all of Season Three has just happened in Steve’s head! He shook hands with his hallucination! I got nothin! JK out! I didn’t get the Scarface reference either, probably because I’ve never seen Scarface. “..now it seems like Danny’s really pissed about this and they’re not being cute anymore and huh. Seriously — what is going on here?? ?” <– yes, this. It was a weirdly stroppy episode. Like they'd all just had a big falling out that we didn't see. The ending… I just… yeah. What the giddy F/CK???? It was a pretty fun episode to recap, all things considered… there was some heavy stuff in there. Also: FIRST ON EVERY PAGE, B/TCHES, YEAH!!! Thought I’d got in first a couple of times. B#mmer! I will remind both of you about this the next time someone posts a recap in the Canadian evening/Australian afternoon. Also, I purposefully didn’t hog all the best comments, but I cannot believe that no-one has yet said CLAW!! CLAAAAAAAAAAAW!!! THE CLAW!!! LOVED THE CLAW MINI-ME!! First I thought the two cops at the end were the remaining two from the photo, who were still alive and thanking Steve for saving them. Then I recognized OOkala and I thought ‘oh really? he DIDN’T die!’ I was a little confused at this point. Then I realized they were ghosts and THEN Papa McG appeared and all I could think was WTFuuuuuuuuuuu.ck Show! I know there’s going to be a lot of people who loved the ending, but not me. I’m a cold hearted b.itch. LOL! I’ll join you in cold hearted b!tich-land then as I had the same reaction. And this from someone who cries at the drop of a hat usually. Again, it just seemed misplaced somehow and McG’s faux handshake was definitely a bridge too far. Excellent recap! Can’t wait for the crayon diary for this one. Yeah the hallucinations were a bit too real and shaking hands was too far. I guess Danny could have been genuinely pissed off with Steve as he did put them them at risk with no flak jackets on but I like to think Danny was also trying to hide his bromantic feelings from Steve. Forgot to say that I did really enjoy this episode, wtf moments aside. Honestly I thought I had accidently switched over to “Field of Dreams” and was waiting for Steve to have a catch with his dad until it was time to head back into the cornfield. “If you build it, he will come.” I was soooo disappointed that line wasn’t in there somewhere. I think I’ll remember this episode as being a good storyline, good action but way too many WTF moments. LOL. I had the exact same “have a catch” thought! Never in a million years would I expect Show to do a ghost thing. WTF is the matter with me…cause I didn’t have any WTF moments!! I LOVED this episode. I thought it had it all…suspense, comedy, great stunts, great guest actors, lots of FEELS, and lots of PRETTY!!! I thought Danny’s little speech about not being worried about Steve is just Danny’s way of trying to make Steve think that he doesn’t care about him…and as usual he failed miserably! As for the “ghosts”…I LOVED that scene… I cried like a baby when papa McG shook his son’s hand and said he was proud of him. I think it was meant to be a peak into Steve’s phsyche…maybe he thought that his father would have been disappointed that he gave up a military career to become a cop…something we know that he discouraged him from when he was younger…and now after catching this cop killer..that his decision was finally validated. OK now I’m having a WTF moment… that last comment was MINE..and not some other wordy chick!! What”s with the anonymous?!!!! Well As usual I have to agree with that anonymous chick. I didn’t have any WTF moments relating to the ghosts, I thought it was pretty cool. I did think it was the other 2 remaining cops at first, but confusion is a normal part of any day for me. Agree CG66, I really, really liked this episode. In some ways much more tightly written than some of their normal shows yet I did have some WTF moments. ACtually I’m better with WTF moments than the STFU moments. I was very confused by the ending at first but liked it on the 2nd watch when i thought about the emotional closure for Steve. The handshake was all in Steve’s mind IMO, and indeed as someone pointed out to me, when Steve turns around his hand isn’t stretched out indicating it was thought not reality. But regardless, this felt much more organic than some of the endings they throw in for emotional manipulation *cough*twin*towers*cough*. At least this actually had something to do with the characters and plot related. It had a purpose other than just for a sucker punch to the heart. Alex once again, proves how underrated he is as an actor. What a great range he hit this week. Too bad it’s overshadowed by the WTF moments. “ACtually I’m better with WTF moments than the STFU moments.” Hehe. Ess, from the procedural angle, I thought it was a really good episode. Quite clever, really, considering it was a remake of a 1970s ep. I agree. I didn’t cry but I liked that scene and no WTF moments in this ep for me. But I found this bit weird, especially with his father coming up and shaking his hand. I did not care for this. Excellent recap Steph 🙂 funny and great sense of sarcasm. 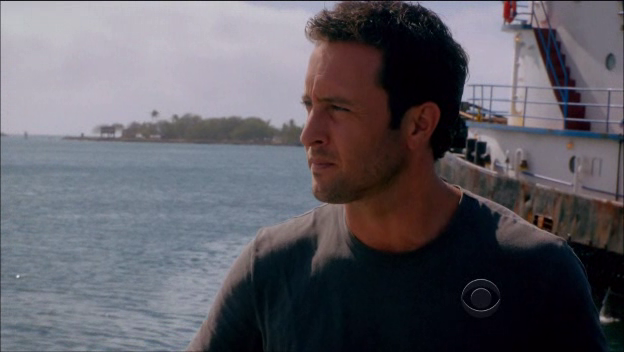 STEVE “I SEE DEAD PEOPLE” McGARRETT. I got a laugh out of twitter after Show aired because it seemed like people were evenly split between WTF and crying about the end. Personally I’m in the WTF camp, but hey, maybe I just wasn’t in the right mood for tears. The ghosts should have had white sheets with cutouts. Just for clarification you know? It wouldn’t have been any more ridiculous. The whole gun shop rant by Danny seemed to come out of left field (of dreams!) for me. There were some nice shots of Steve which is about all I loved about this episode. Those white pants, which I was a bit ‘meh’ about before, have to go. They make him look fat. 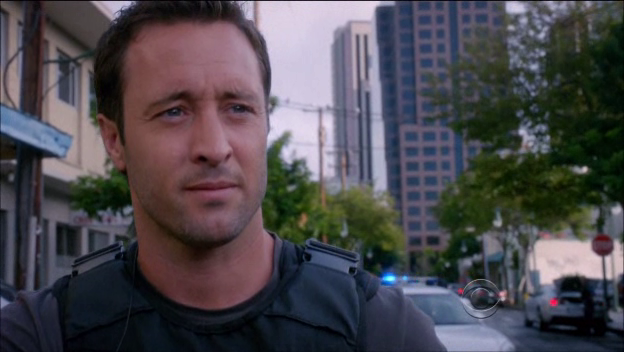 Steve’s grin when Danny said he was touched in the head… THAT was a good shot of Steve. ^^^LOL 🙂 Canuck high five! I think we’re all on the same team when it comes to no pants but if he HAS to wear pants, they have to be good and, try as I might, I cannot put the white ones into that category :). “*ducking and running from the #whitepantsbrigade” – not worth the effort, babe. White sheets with cutouts. Lol! That makes me think of the scene in Django if anyone’s seen it. p.s. STEVE IS NOT SKYWALKER. STEVE IS HAN SOLO. Does that make Danny or Cath Princess Leia? And I wondered why McG wasn’t first on his list seeing as McDad actually caused Hookman’s hands to be blown off. This makes sense. Because we all know how Steve is completely unaffected by torture. Wanna hang him up and beat the crap out of him? No problem! The hands getting blown off was way too much for me. His hands getting blown off was awesome!! Because I’m weird. And it’s TV. Not awesome at all in real life. I thought the same thing about the bullets and Kim straightened me out. He didn’t actually shoot the inscribed bullets, he left them at the scene instead. But the first ones were shells of used bullets. the McGarrett one was a unused bullet though….. I don’t think he had ever loaded it. It really looked like he was aiming at Danny at the gun shop. I think he had a bunch of random bullets because at that point on he was just “on the run” not able to meticulously set up his “kill shot” like he did for the other 3 guys he shot (the two that died & then Duke). Maybe if he’d shot Danny, and that fixed McG in position for another minute, he would have loaded that bullet and shot McG, too. Just a theory. A chilling scenario but very logical. The only thing I thought that would never happen, was seeing grownup Steve next to dad and show how much shorter William is than Alex. Mom being just as tall as Steve, kinda make mom and dad a odd couple…..not that I have anything against a couple where the woman are taller than the man. It just always look different to me. Aha, the ghosts can have their own ‘memorable guest performers’ post here at Westy’s Champ Box! It IS lucky that Christine Lahti is tall. Dad and Mary are more alike. By the way, I’m taller than my husband, FOYeur :). Not something I had planned on, but there you go. I do not know how big the difference is with you and NotMcG, but in the case of pop & mom McG, it is quite significant I think. – she sometimes seems taller than Alex as well…. I remember Wm. Sadler tweeting that he was done shooting, and it was really early in Hawaii, that scene was done super early in the morning. Randomness. Great recap, JK! I really loved all your sarcasm. I think we watch similarly, because there was a lot of WTF for me. Why was Danny so pissy? Why was he wearing grey, especially since the new dad face is hella tired looking and the grey exacerbates it? Why were there ghosts? Why the forced gun control debate? And by “he,” I mean Steve. This was a Very Special Episode…. for sure. Thanks Sage! I actually really did like the episode too…. it sure was an odd duck though. You’re welcome 🙂 and yes, yes it was. I like this ep better each time I see it. I love that Danny comes out of cover as he is so worried about Steve and Steve is both pissed off about this and touched at the same time, then Danny plays it down. I can’t tell exactly what Danny says near the end ‘Dont listen to me, don’t listen to ?…..for you’ It sounds like ‘reason’ but it doesn’t quite make sense. Anyone know? I love the ‘that’s very you of you’ It reminded me of the ‘Don’t quote me to me’ bit in the Danny’s ex partner burnt in the pit ep. (I sometimes wish the eps had English titles I could remember them by). the more I think about it, the more I like it too! That’s interesting, haven’t seen all of Scarface. Link to the scene in Scarface. Love Al Pacino. Warning: Violence (obvi) and ending spoiler. Darn, CarolineinNZ beat me to it — I was thinking “say hello to my lil friend” while reading all these comments. But then its still only Wednesday the 6th here in California. 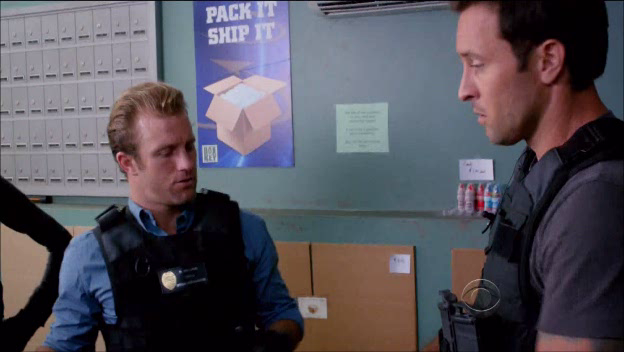 As for Danny’s rant in the gun shop – I’m thinking that might have been a Scott Caan ad-lib that pLentkov left in. Scotty is way more likely to be pro-gun-control than Danny – cops understand that gun control only keeps guns away from good guys – the bad guys will still get them. Awesome recap, SJ! It was an odd episode. I’m old enough to remember a little bit about the original (I had a mad crush on the original Danno, James MacArthur), and they really did capture the old feeling. I’m just not sure I liked it all that much. Glad I’m not the only one who liked James MacArthur. Are you a Steve only girl now? What was the name of the medical show from YEARS ago with Howie Mandel, they made the series finale into the entire series being the dream of an autistic kid?? Must google!!!! ok, whats up with WALKING AWAY FROM A CRIME SCENE AND LEAVING DEAD KILLER BEHIND? Don’t they have to wait for the uni’s to show up, I mean robo-claw wasn’t even covered up and they are splitting the scene?? WTF Halpin?? I thought the same thing when watching, but I noticed their were a couple uniforms standing there. Still looked weird. 😆 OK, Momo, my pleasure.